If you are trying to stick to the Paleo diet it is important to have healthy and convenient snacks on hand when you get hungry. Read below for advice on how to choose a Paleo approved protein bar along with a few products you can try. Whether you’re an athlete gearing up for a big workout or you just want a healthy, filling snack to keep in your bag, protein bars are the perfect solution. But when you’re on the Paleo diet, finding them can be a daunting task. Processed ingredients and grains are found in nearly every protein bar! Luckily we found a few you can feel good about eating. Whey protein, the most commonly used protein supplement, is a major source of controversy in the paleo community. Whey is a protein found in cow’s milk, making it technically a component of dairy. But because the other parts of the milk including the sugars (lactose), casein (another protein) and other components are separated away from the whey, should it really be considered dairy? This is an argument that paleo athletes debate often. People who are against consuming whey protein while eating paleo also speak against it for its processed quality. Because it is an isolate protein from milk, whey protein obviously goes through major processing to be made. Unlike real, whole food protein sources like beans, nuts, and meat, whey protein is only a part of a food. It often contains added sweeteners and preservatives, too. When searching for a paleo-friendly protein bar, try looking for ones with a decidedly non-dairy protein source. Many bars use pea, soy, or nut proteins to give you all the power without the dairy. There’s no nutritional benefits you can get from whey protein that you can’t get from other, real food sources. For this reason, those sticking to the paleo diet should probably avoid this protein source unless you are a serious athlete trying to build major muscle fast. With so many bars to choose from, picking the paleo protein bar that is right for you can be daunting. There are so many flavors, ingredient combinations, and sizes! If you follow our tips below, though, choosing will feel a lot easier. The first element to consider is the amount of protein you want in each bar. Paleo-friendly protein bars usually contain between 4 and 20 grams of protein each. For those who just want bars to eat as an on-the-go healthy snack, a smaller amount of protein is sufficient to tide you over. However, if you’re intending to eat your bars as a post-workout supplement to help you build muscle and keep your body feeling its best, choose a bar with more protein. Another key factor when choosing the perfect protein bar for you is flavor choices. Do you prefer decadent flavors that taste like healthier versions of your favorite desserts? Or are you more into the fruity, nutty flavor profile? Finding your favorite varieties will take some trial and error but brands with flavor combos you would never have thought of are a good bet. Just be sure to read the labels of chocolate flavored bars extra carefully; they may contain sneaky dairy! No matter what flavors you prefer, the ingredients list is arguably the most important part of a paleo-approved protein bar. Grains, dairy, added sugars, and preservatives should definitely not be on the ingredients list of the bar you choose. For best results, choose a bar that contains organic ingredients that are non-GMO. As you surely know, a huge part of the paleo diet is eliminating processed foods. This allows the body to run on whole, real foods that haven’t been modified and don’t contain chemicals to make them shelf stable. It’s how our bodies were meant to be nourished! While many paleo-friendly protein bars stick to this idea, others have the same overly manufactured quality as non-paleo bars. Check to be sure your brand is made fresh. A good indicator is if they require refrigeration and have a super short shelf life, they are probably made with real food! Why Eat Paleo-Approved Protein Bars? Ideally, we would always have time for a healthy, home-cooked meal. But with the busy lives we lead today, that’s basically impossible. We can’t always have a juicy steak and a side of veggies at hand! Rushing to work in the morning, long airport layovers, a rumbling stomach near the end of the work day; all of these moments force us to make a food choice. We could take the easier route and grab greasy fast food or sugary treats. On the other hand, we could go for a more nutritious snack. That’s where paleo-friendly protein bars come in! Fruits and veggies make amazing, healthy snacks, but sometimes they just don’t cut it. If you feel sleepy or super hungry, protein is the way to go. Paleo-friendly protein bars are usually small enough to stash in your glove compartment, bag, or desk drawer and can be eaten anywhere. They’ll give you energy and fill you up without being messy or hard to eat. Paleo protein bars are also a great solution for athletes. Those who play sports or are really into working out need extra protein to help recover and build muscle. But often protein bars contain dairy, added sugar, grains, weird chemicals, and are processed to death. Paleo-approved bars like the ones listed below allow your body to be its best without upsetting your stomach or breaking your diet! DELICIOUS, MELT-IN-YOUR-MOUTH, BUTTERY CINNAMON GOODNESS!- But don't worry, we don't actually use butter or any dairy! These are AIP and Paleo compliant. 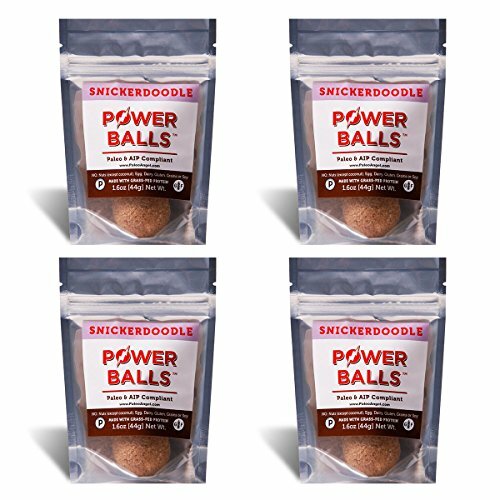 While they aren’t exactly bars, these little balls of nutritional goodness are perfect to snack on when you’re on the go. They taste just like your favorite cookies but pack 4 grams of protein each! These powerful snacks are a great way to get kids into eating paleo. With no dairy, eggs, tree nuts, or grains, they’re perfect for people with food allergies, too. They’re made with organic raw coconut, which can be a bit dry and somewhat of a downside if you don’t care for coconut. Power Balls are naturally sweetened with coconut milk and organic raw honey, so there’s no bad-for-you sweeteners to be found. Finally, they’re finished with a bit of Himalayan pink sea salt, which not only enhances the flavors, it also packs health benefits including improved respiratory function and better digestion. A downside to these is that only two come in a pack, so be prepared to stock up if you love them! 12 Primal GRASS-FED Whey Isolate Protein Bars. Provides 20+ gm of the BEST PROTEIN (non GMO). VERY LOW SUGAR (1 gm) - no chemical sweeteners or sugar alcohols ever! 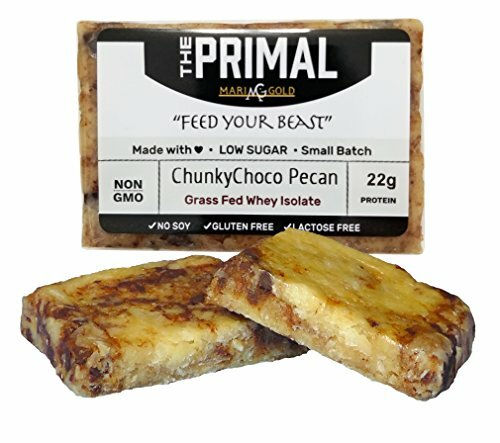 If you want a pure chunk of protein that tastes great, THE PRIMAL should be your new go-to. These contain zero lactose, casein, gluten, grains, or soy, so it’s perfect for those with food allergies as well as paleo eaters. 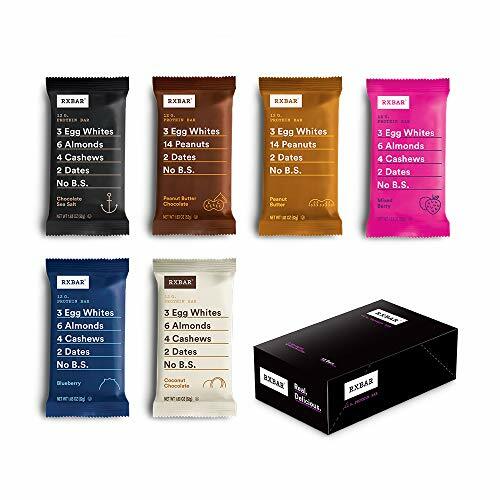 Each bar contains a crazy 20 grams of protein so whether you’re on a hike, gearing up for a workout, or just majorly hungry, these bars will fill you up. The downside to these bars is that they use whey isolate as a protein source. If your idea of sticking to the paleo diet means you won’t eat anything in any way related to dairy, these are not for you. Beware, too, of their short shelf life. Because these bars are made with only real food ingredients and no preservatives, they go bad fast, even when kept in the fridge. Keep them in the freezer if you want to eat them at your convenience! No added sugar, no gluten, no soy, no dairy, no GMO, no B.S. 12g of egg white protein, ~4g of fiber, 200-210 calories. Perfect as a breakfast bar on-the-go, pre- and post-workout fuel, or a convenient and healthy snack mid day. With RXBARs, you don’t have to wonder what they are made of. They say it right on the front of each bar’s packaging! Made with egg whites, almonds, cashews, and dates, these are made with real food ingredients. None of those crazy chemicals found in many protein bars! With 12 grams of protein and 4 grams of fiber, these make a super filling snack for a road trip, hike, or post-workout. They contain no added sugar, gluten, dairy, soy, or GMO ingredients so they are great for paleo eaters and food allergy sufferers alike. Due to them being made of dates, these bars have an extremely chewy texture. Unfortunately, they can stick in your teeth and be hard or even uncomfortable to eat. Though it is marketed as tasting like apple pie, the flavors of these bars is also very light so if you don’t enjoy the taste of dates, give these a pass. Of the paleo-friendly protein bars listed above, it’s hard to choose the absolute best one. Their wide range of unique flavors and nutritional benefits make them all great! However, the YES Bars are our number 1 pick for top paleo-approved protein bar. They are shelf-stable and small enough to tuck into any bag or drawer for convenient snacking. They also come in delicious, unique flavor combinations so good you won’t be able to choose a favorite. Made with real, good food, they’re easy to digest and won’t leave you feeling sluggish like other snack bars. These are perfect for busy people who need healthy snack options for on-the-go and taste so good, even kids will love them!